This is a delicious Thai-inspired curry with an easy homemade curry paste that can be whipped up in a few minutes in a blender. 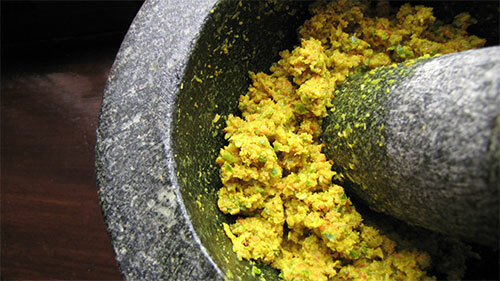 Although the curry paste is yellow-green, the curry itself will end up being more of a yellow colour from the turmeric. Feel free to add/substtute any other vegetables like broccoli, cauliflower, green beans, carrots etc. As with all curries, this one is perfect served with a big batch of steaming hot rice. Serves 4-6. ¼ cup chopped fresh coriander leaves. Deep-fry the potatoes in the oil or ghee in a wok or deep frying pan until golden brown and tender. Drain and set aside, covered. Heat 2 tablespoons oil in a heavy saucepan over moderately high heat. Stir in a bit more than half of the curry paste (or more for a spicier curry) and fry it in the hot oil for 2 or 3 minutes, or until it starts to stick on the bottom. Add the coconut cream and the lime or lemon juice, and cook for 10-15 minutes, or until the sauce is fairly reduced.Stir in the fried bean curd, and mix well. Heat through for 5 minutes. Mix in the cabbage, cooked green peas, and the fried potatoes. Add enough vegetable stock to form rich gravy. Simmer for a further 5 minutes. The potatoes will soak up a fair amount of juice, so be prepared to add more stock. Fold in the fresh coriander. Serve hot with lots of hot rice. 2 tablespoons grated dark palm sugar. Process all the ingredients in a blender to form a smooth, green paste. If necessary add a few teaspoons water. You’ll need a bit more than half of this paste for the curry. Spoon the remaining curry paste into a clean, screw-top jar and refrigerate for up to 3 weeks.